Antarctica's University Valley, where later this month NASA's IceBite team will field-test Honeybee Robotics' rotary-percussion drill, boring a meter deep into the subsurface ice. Over the course of the past decade, NASA spacecraft have identified several sites on Mars where conditions capable of supporting life existed in the past. One of the most promising of these sites, and a good candidate for a follow-up mission designed explicitly to look for signs of life, is the shallow subsurface at the Phoenix landing site in the arctic northern plains of Mars. Indeed, some scientists believe the region where Phoenix landed may still be habitable today. As an early step toward developing the technology for a return mission to the Martian polar north, members of NASA’s IceBite team will head out this month to explore University Valley, in Antarctica’s Dry Valleys. Astrobiology Magazine will be following their activity while they’re in the field, regularly posting blog entries from IceBite team member Margarita Marinova. Visitors to the Astrobiology Magazine site will be able to ask questions of the IceBite team by clicking the Ask a Scientist button that will appear in our IceBite stories and blog entries. Last year the IceBite team conducted reconnaissance in University Valley and placed a series of weather stations there to monitor conditions during the Antarctic winter. This year, they will return to test IceBreaker, a drill designed and built by Pasadena, Calif.-based Honeybee Robotics. Ice Breaker can burrow up to a meter (3 feet) into the ice and frozen soil and deliver samples to the surface for scientific analysis. IceBreaker is a rotary-percussive drill: it both rotates and hammers on its target. By combining percussion with rotary motion, "you get a highly efficient drill system," says Kris Zacny, director of Honeybee’s Drilling and Excavation Program. Rotary-percussive drills are hardly a rarity; you can buy them off the shelf at Home Depot. But IceBite has been optimized for the frigid, near-vacuum conditions on Mars. For example, while most drills are lubricated to prevent their internal parts from sticking to each other, because Mars is so cold, IceBite’s internal parts are instead coated with a Teflon-like anti-stick surface. “Then we’re going to pick it up and put it in the back of a truck, and drive it to a remote site near McMurdo, an unaltered site, and drill in the rock of McMurdo, which is probably a better Moon analog than Mars analog,” says McKay. The final test will be in the still-more-remote University Valley, accessible only by helicopter. IceBite has been tested successfully in Honeybee’s Mars Simulation Chamber, where the temperature and atmospheric conditions can be tuned to approximate those on Mars. But the upcoming tests in the Antarctic will be the first time the drill will be subjected to the uncertainties of field operation. They’ll also be looking at how effective the drill is at delivering useful samples to the surface for scientific analysis. In the lab, “we prepare our own [rock and ice] simulants,” says Zacny, "so we kind of understand what can go wrong. In the field, however, “you have no idea what’s below the surface "until you drill and you see the cuttings of samples being conveyed to the surface." In addition to testing IceBreaker, the IceBite team plans to map the depth of the subsurface ice, both in University Valley and in other nearby valleys. "A question has arisen as to what sets [the ice] depth," says Margarita Marinova, a research scientist at ARC. "So a lot of my time will be spent on actually going through the valleys, digging pits or poking holes and trying to figure out what depth to the ground ice is." Another team member, Andrew Jackson, an associate professor in the Department of Civil and Environmental Engineering at Texas Tech University in Lubbock, Texas, will study perchlorate. Historically, Jackson’s research focus has been on terrestrial perchlorate, in particular its impact on the Earth’s ozone layer. On Earth perchlorate occurs primarily in very dry places, such as the Atacama Desert in Chile. It is known to exist in the Antarctic Dry Valleys, but no-one has yet studied its presence there. In addition to shedding light on Earth's climate, perchlorate, which was found in the soil at the Phoenix landing site, is important to understanding the possibility of life on Mars. Perchlorate acts as a strong anti-freeze, lowering the freezing point of water. "Most salts do this, but perchlorate is particularly good at it," Jackson said. "If we can see that in Antarctica, if we can show this perchlorate is actually doing that." Jackson added that "that’s really important for Mars," where temperatures rarely get above the freezing point. In addition, many terrestrial microbes can "breathe" perchlorate in place of oxygen. 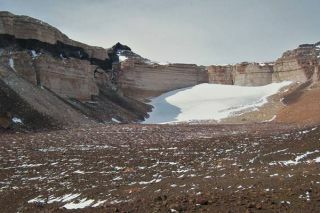 If perchlorate-respiring microbes are found living in tiny pockets of liquid water within Antarctica’s subsurface ice, perhaps the subsurface ice in the frozen northern plains of Mars could also be considered a viable habitat for present-day life. The IceBite project is funded by NASA’s ASTEP (Astrobiology Science and Technology for Exploring Planets) program.